Dani Noir [Mini-Review] – my books. my life. If this were a movie, you’d open to the first page of this book and be transported to a whole other world. Everything would be in black and white, except maybe for the girl in pink polka-dot tights, and this really great music would start to swell in the background. All of a sudden, you wouldn’t be able to help it — you’d be a part of the story, you’d be totally sucked in. You’d be in this place, filled with big lies, mysterious secrets, and a tween girl turned sleuth…. Zoom in on thirteen-year-old Dani Callanzano. It’s the summer before eighth grade, and Dani is stuck in her nothing-ever-happens town with only her favorite noir mysteries at the Little Art movie theater to keep her company. But one day, a real-life mystery begins to unravel — at the Little Art! And it all has something to do with a girl in polka-dot tights…. Armed with a vivid imagination, a flair for the dramatic, and her knowledge of all things Rita Hayworth, Dani sets out to solve the mystery, and she learns more about herself than she ever though she could. 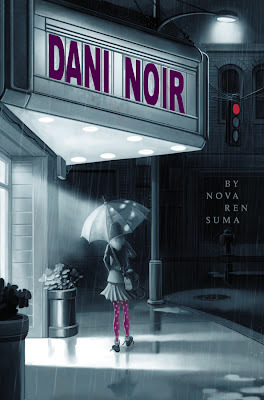 Dani Noir was recommended on the Middle Grade Literature Wave during my brief time with Google Wave (when we all thought it would be amazing and turned out to be very unamazing). I read a few weeks ago during the readathon. Dani Noir was a great readathon book – short and interesting. Dani is a unique character and an interesting narrator. She is obsessed with old movies and they color her storytelling. Nothing extraordinary really happens in Dani Noir, but the way the plot unravels and the spin Dani puts on it is what makes this book. If you like quirky middle grade lit (think When You Reach Me), I’d recommend giving this one a shot. And doesn’t it just have a wonderful cover? I love the cover! And now I want to own these tights 😉 I like child or teen detectives, they put a unique voice to the story. My library doesn´t have it yet, but I´ll suggest they acquire it! I want the tights, too. But only if I can otherwise be in black and white. * = said in Jack Bauer voice. You must read them within the hour. These books are our only lead! Low beep. High beep. Low beep. High beep. Low beep.